In our $6,500 Low Poly Mobile Game Packs competition, 3D modellers were encouraged to submit their best Low Poly Mobile Game Packs for iPhone or Android to 3DOcean. Thanks to the Cgtuts+ and 3DOcean review team we’ve finally picked our winners! Before the winners are revealed, I want to thank and congratulate every participant. Most items were excellent quality and the response to participate was overwelming. It’s a shame we could only pick three winners. Nonetheless, many of these items will be featured on 3DOcean collection soon. To the winners, we’ll be in touch with you shortly to hook you up with your prizes! Oh, and congratulations, you talented creative people! 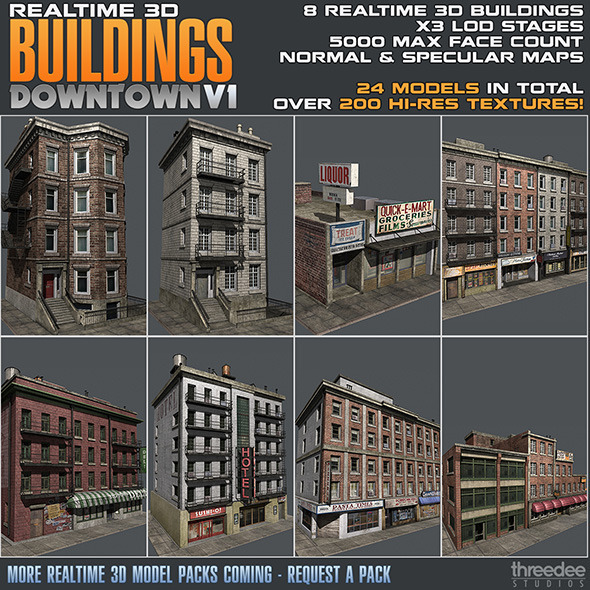 This item includes a professional collection and includes eight unique realtime 3D buildings with a ‘Downtown’ theme ready for realtime use in games, visualisations and interactive 3D projects. This is an Outpost Pack. All models are low poly and ready to be used in game. A low poly fantasy tower defense starter kit. It containing one tower, nine weapon and a shelter model. Plus additionnal props including a tree, rock, fence and wooden post. Still want more? Check out this all items in our category of 3D Models.